China is not only one of the world’s largest debtors, it is one of the world’s largest creditors. China uses debt not in the customary financial manner, but as a political tool to generate employment and maintain social stability. Likewise China uses loans and investment as a tool to advance its strategic interests. This may be good geopolitics in the short run, but it will be a disaster economically in the long run. Just as Chinese state owned enterprises (SOEs) can’t repay debts to Chinese banks, China’s foreign partners will not be able to repay debts to China itself. These twin disasters-in-the-making may converge in such a way that China’s assets disappear or become illiquid at exactly the time they are most needed to bail-out its own banking system. China has launched four major overseas investment initiatives in the past ten years. The oldest is their sovereign wealth fund, China Investment Corporation, or CIC, established in 2007. Sovereign wealth funds are a way for countries to invest their reserves in securities other than safe instruments such as U.S. Treasury notes. CIC today has assets of over $800 billion, spread among stocks, corporate bonds, hedge funds, private equity, commodities, and commercial real estate. Some of CIC’s investments are directly-owned enterprises, including gold mines in Zimbabwe. While these assets may outperform Treasury notes over time, they are also illiquid, and would tend to decline in value during a financial panic. This means that about 20%, of China’s reserves are unavailable for critical tasks such as bailing out the banking system or defending the currency. The second and third initiatives are the New Development Bank, NDB, created by the BRICS in 2014, and the Asia Infrastructure Investment Bank, AIIB, created by China in 2016. These have participation from 35 countries in the Asia/Australia region, and 18 other countries from outside that region, mostly in Europe. The United States refused to join. Although NDB and AIIB are both multilateral institutions, China was the principal sponsor and a major source of funding. It provided about $10 billion to NDB and $30 billion to AIIB. These banks will expand their lending capacity by issuing notes and will fund infrastructure projects in competition with the World Bank and its regional development banks — without interference from the U.S. on priorities. By far, the most ambitious outbound investment effort by China is the “One Belt, One Road” initiative. The “belt” refers to overland routes from central China to Europe. The “road” refers to maritime routes from eastern China to Southeast Asia, Africa, and Europe. It is a recreation of the original Silk Road caravan route of the thirteenth century, and China’s glory days as a naval power led by Admiral Zheng He in the Ming Dynasty in the early fifteenth century. The scope of the One Belt, One Road initiative is immense. It will include port facilities, railroads, highways, telecommunications channels, airports, transshipment facilities, renewable energy sources, and more strung out from Xian to Rotterdam, and from Guangzhou to Venice. The graphic on the previous page shows the main corridors of the belt and road, but there are many ranches and capillaries not shown in detail. Of these offshoots, one of the most critical is a transportation link from Kashgar in western China to the port of Gwadar on the Arabian Sea in Pakistan. This route passes through disputed territory in Kashmir that could lead to a war with China and Pakistan on one side, and India on the other. Another critical belt link runs from Kunming in southern China through Myanmar, Thailand, and Malaysia before terminating in Singapore. 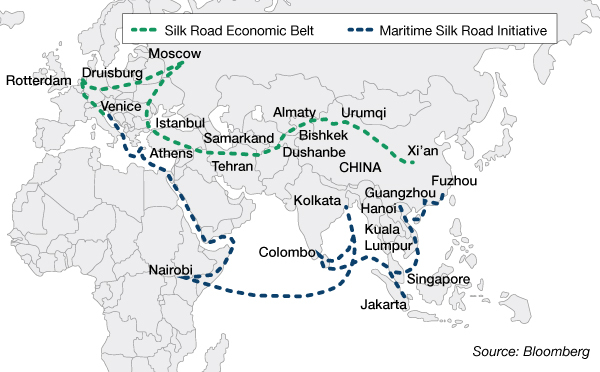 Main routes in China’s “One Belt, One Road” Initiative are shown above. The overland belt is in green and the maritime road is in blue. At a global leaders’ summit in Beijing on May 14–15, 2017, President Xi Jinping of China laid out his vision for the One Belt, One Road and committed $55 billion of lending capacity. Vladimir Putin, president of Russia, was one of many foreign leaders present. The U.S. sent a low level delegation, probably including CIA assets, attempting to get a read on Putin, Xi and the North Korean delegation. The problem with One Belt, One Road is that many of the potential recipients of development loans are not highly creditworthy or have a track record of defaulting on debts or requiring substantial debt restructuring in order to stay current. As with Chinese bank loans to SOEs, the NDB, AIIB, and One Belt, One Road efforts are not primarily economic but political. China is seeking to use its economic clout to create jobs and control critical infrastructure. As with its other policies, China will turn liquid assets into illiquid assets in order to pursue its ambitions. This could make sense if nothing goes wrong. But, things will go wrong. China will face a monumental liquidity crisis sooner than later and find that its liquid assets have been turned into bridges to nowhere. James G. Rickards is the editor of Strategic Intelligence, the latest newsletter from Agora Financial. He is an American lawyer, economist, and investment banker with 35 years of experience working in capital markets on Wall Street. He was the principal negotiator of the rescue of Long-Term Capital Management L.P. (LTCM) by the U.S Federal Reserve in 1998. His clients include institutional investors and government directorates.